Deadbeat Customs is proud to announce the addition of Z1R Helmets and Riding Apparel to our catalogue. Z1R has been producing quality riding apparel since 1995, taking old school styles and updating them to comply with modern safety standards. If you’re looking for a new helmet or jacket, we certainly suggest you take a look at these newly available items by Z1R! Z1R updates your basic flannel shirt with The Duke; a 100% cotton flannel, lined with a moisture-wicking polyester, made to keep your body temperature comfortably regulated while riding. The expanded shoulder gussets allow increased flexibility. This flannel shirt has two interior concealed carry pockets, two exterior chest pockets, and one interior chest pocket. Metal snaps and a concealed zipper replace the basic buttons typically found on a flannel shirt, for improved wind protection. With a drop-down sun visor, available dual shield, breath box, and electric shield, the Solaris Modular Helmet is fit for year-round use. Vents at the chin, top, and back of the helmet allow increased airflow through the helmet for your own ventilation. Replaceable polyester moisture-wicking material lines the inside and cheek pads for extra comfort against perspiration. Protected by an injection-molded polycarbonate shell, this is a perfect year-round helmet. 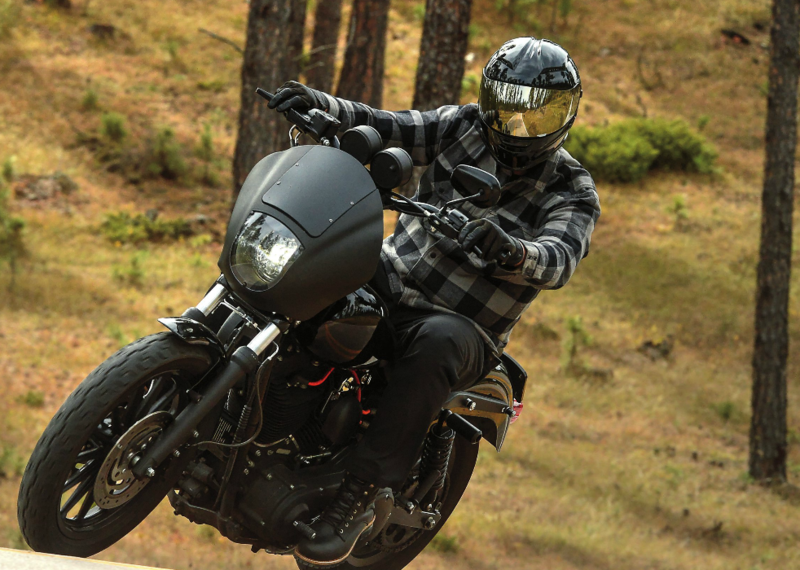 The Range Dual Sport is a versatile sport style helmet. With a removable face shield, drop-down sun visor, and replaceable polyester moisture-wicking cheek pads, the Range Dual Sport provides you with the option of adjusting or removing parts in any condition. The Range Dual Sport is protected by a thermoplastic injection ABS shell for great strength, and excellent impact resistance. If you’re searching for a streamlined look and aerodynamic design, take a look at Z1R’s Strike Ops helmet (pictured above, left). Like most of Z1R’s other helmets, the Strike Ops is lined with replaceable moisture-wicking material. The design of the outer shell, high volume intake and exhaust vents use aerodynamics to provide exceptional performance on the road. If you find the Strike Ops design a little plain, Z1R also provides the Strike Ops SV (pictured above, right) helmet which uses a nearly identical design with a drop-down sun visor. The Jimmy 3/4 Helmet is available in two separate versions. The Jimmy Helmet is a 5-snap helmet compatible with most 3- or 5-snap face shields. Spacious ear pockets allow you to pop in earphones or speakers without compromising headroom. The Jimmy Solid features a 3/4 shell, with a matte black trim. The Jimmy Solid includes a 3-snap sun visor. The Jimmy Rubatone features the same design with a Rubatone finish, and a chrome-plated trim. This version does not include a sun visor. Z1R’s Jackal Helmet uses an aerodynamic design for better stability while riding. The Jackal provides ventilation through intake and exhaust vents, engineered for some of the best temperature regulation currently available in a helmet. The Jackal Aggressor Helmet takes the original Jackal design and adds a custom flair, available in a few different color sets. Find this riding gear and more by Z1R at DeadbeatCustoms.com!